When bands play Liberty Hall, they usually park their bus on Seventh Street, on the south side of the building. Prior to Jonsi’s show on Thursday night, that space was conspicuously empty except for two huge generators with power cords running inside the theater. The generators only hinted at the energy Jonsi, lead singer for the atmospheric indie rock band Sigur Ros, would pour into his 80-minute set. The performance culminated with “Grow Till Tall” and the most powerful emotional moment I’ve experienced at a concert. Before we get to that, however, a little context is appropriate. The Icelandic quartet Sigur Ros formed in the late ‘90s, but didn’t break through until their 2002 release. The album didn’t have a title – fans have named it “()” or parenthesis based on the symbols on the cover – or song titles. The lyrics are in Hopelandic, a nonsense language the band invented. It’s admittedly pretentious, but surprisingly accessible once one gets past the packaging and listens. Sigur Ros songs are built on minimalist structures equally influenced by rock, classical and ambient elements. Imagine Radiohead singing in a foreign language spiked with a heavy dose of Brian Eno and you’re getting close. On his own, Jonsi still hews pretty closely that sound. Although he didn’t perform any Sigur Ros songs on Thursday, he likely could have slipped one in and only the audience response would have given it away. Backed by a four-piece band that included his partner Alex Somers on guitar, Jonsi delivered all of “Go,” his debut solo album released this month, and four new songs that didn’t make it on the record. Jonsi and Somers, the masterminds behind “Go,” crept onstage together in the dark, the unmistakable falsetto of Jonsi’s voice marking their entrance. 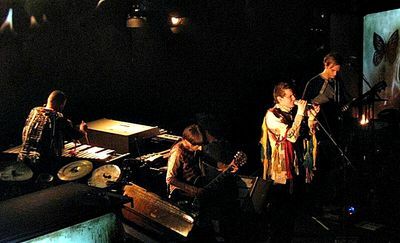 While Jonsi played acoustic guitar, Somers used a violin bow on vibraphone keys to create a gentle feedback. The rest of the band emerged on the next number, but this approach – Jonsi’s gorgeous, angelic voice placed within inventive settings – remained a hallmark of the night. The music was bolstered by the theatrical staging. 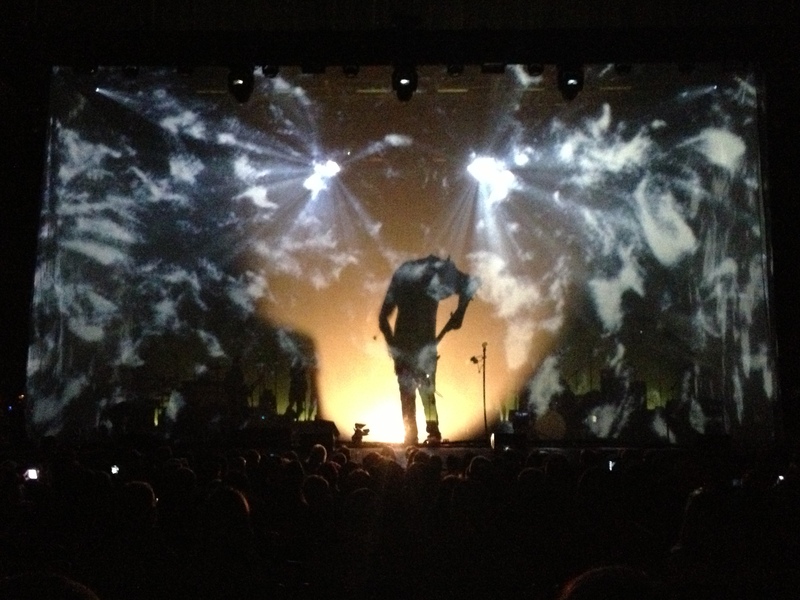 Four large, luminescent boxes framed the stage and an intricate glass and screen installation stood behind the band. As the projections on the boxes and screen changed, so did the mood of the room. All the images were developed by 59 Productions, and at times the combination of music and visuals threatened to overwhelm the senses. One could almost feel the heat from the fire projected around the band, smell the ozone after the simulated storm and taste the fat, wet raindrops dripping down the screens. The band shifted textures by changing instruments after nearly every song. On a given number there might be three people playing keyboards, or two guitarists, or toy piano, percussion, vibraphone or digital manipulation. The consistent musician was drummer þorvaldur þorvaldsson. Þorvaldsson attacked his kit with the power of John Bonham or Dave Grohl, but had the finesse of a seasoned jazz drummer. More than any one player, he could change the mood of a song with a single cymbal crash and he was frequently the driving force behind the powerful crescendos. 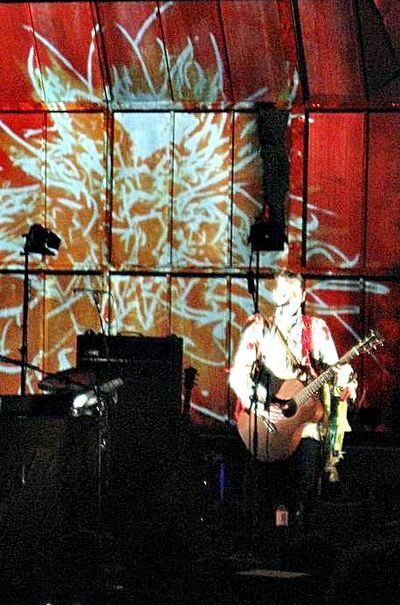 The main set closed with Jonsi on piano, a single light shining over his shoulder. It felt like the house was privy to a late-night songwriting session. The number, appropriately titled “New Piano Song,” gave way to “Around Us.” As the melody entered, a golden glow of light settled on the crowd that felt like a sunrise. The song ended with Jonsi’s singing dissolving into a digitized barrage of vocals that ended suddenly, letting his live, pure sound ring out. The sold-out crowd responded as it had throughout the night, waiting until the number was finished, then jumping to its feet with applause. Each number was held hushed reverence, punctuated by delighted bursts of applause between numbers. It seemed no one wanted to break the spell by talking. Pristine sound also helped perpetuate the atmosphere. As the song shifted, autumn settled on the forest and falling leaves swirled around the musicians. The leaves gave way to a gentle snow, which warmed into a hard rain. As the rain intensified so did the performance. Jonsi was bent over at the waist, singing into the floor and the rest of the band flailed as if caught in a terrific wind. Like a roller coaster car inching its way to the top of a hill, the music kept ratcheting in intensity, building past any release point until it became a dense sheet of white noise, and even then it continued to swell. It seemed the only thing that kept the audience from being engulfed by the sound and the building from being torn apart was the fragile magnificence of Jonsi’s voice that penetrated the noise. Three hours after that moment, the emotion remains strong. In a review posted on Jonsi’s Web site moments after the show, one fan stated that the performance had taken her through every emotion except anger and she knew she wouldn’t be able to sleep. That should have given her plenty of time to drive up to Minneapolis for the next concert. I know of at least one person ready to go with her. Setlist: Hengilas; Icicle Sleeves; Kolinour; Tornado; Sinking Friendships; Saint Naïve; K12; Go Do; Boy Lilikoi; New Piano Song; Around Us. Encore: Animal Arithmetic; Grow Till Tall.